When searching for the best Blu-ray player there are a number of factors you should consider. First you need to decide if you want a player that can play 4K Ultra HD discs, standard HD Blu-ray discs, or one that is capable of up-scaling standard discs to 4K quality. UHD players are just now coming on the market and will be the focus of a future article here on RelevantRankings.com. For this post we will be focusing on models that play standard Blu-ray discs that may or may not be capable of up-scaling content to 4K to take advantage of 4K Ultra HD TVs. The vast majority of these units are now wireless Blu-ray players since they include built-in Wi-Fi so you can also stream content from popular services like Netflix, Amazon, or Hulu Plus. Most also have a USB port so you can load videos or music from an external drive. In addition to these, some other important features to look for when shopping for a player include image quality, 3D capabilities, streaming services and other apps, HDMI ports, and audio outputs. Below you can read our Blu-ray player reviews for the top 10 best players. We picked models from a variety of price points including expensive home theater quality systems and cheap players. Below our top 10 list you will also find a comparison chart with all the important specs of each model. The Cambrige Audio CXU is our choice for the best Blu-ray player. At $1300 it is designed for the high-end audiophile. The performance will not be matched by any other player with the ability to upscale DVD’s and Blu-ray discs to impressive 4K quality and it can handle virtually any audio formats while also upscaling audio to 24-bit/192 kHz. It includes a host of inputs including 2 HDMI and 3 USB ports, while also featuring optical, coaxial audio, and 7.1 audio outputs along with 2 HDMI outs. This gives the user a ton of options to wire up their dream system. If you are looking for a blu-ray player that looks and sounds the best regardless of price then this thing is for you. Just be aware that it is not considered ‘smart’ in that it does not have streaming services like Netflix or Hulu built-in. The Samsung BD-J7500 provides everything you could want in a Blu-ray player with a price just under $200. The 4K upscaling is excellent and can rival much more expensive models while 1080p video quality looks great too. It features tons of apps including Youtube, Hulu Plus, Netflix, and a web browser. Audiophiles will like the dedicated 7.1ch audio outputs and the digital optical output. The Samsung BD-J7500 is for those of you who want a smart player that can upscale to 4K UHD and take advantage of the audio outputs. With a price of almost $200, though, there are cheaper options that can do almost everything this machine can do. Our pick for the best Blu-ray player under $100 is the Samsung BD-J6300. This Samsung model provides fewer inputs and outputs – just one HDMI and one USB port. However, it will upconvert to 4K UHD, is 3D capable, and features a ton of apps including Netflix, YouTube, Amazon Prime, and web browser. The controls on the unit are a bit difficult to use, but that is only a slight negative. Overall the Samsung BD-J6300 is a good choice for those of you looking for a quality Blu-ray player under $100. The $128 Sony BDP-S6700 packs a ton of features into a single unit including some you won’t find on most other players. The standard features include 4K upscaling, WiFi, 300+ streaming sources, and USB port. The unique features include multi-room streaming and Bluetooth connectivity with LDAC which lets you use wireless headphones and game controllers. As for negatives, the Sony BDP-S6700 does lack an digital optical output and there are a few small bugs when using or switching between some of the apps. Some people have also complained that their Bluetooth devices have compatibility issues with this unit. The $98 Sony BDP-S6500 is very similar to the BDP-S6700, but does not support Bluetooth, nor does it have the multi-room streaming capability. It does provide a solid 4k upscaling and 3D capability while providing tons of apps to access streaming content. Overall the Sony BDP-S6500 is another good choice for a Blu-ray player costing less than $100. 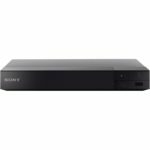 For those users who don’t need 3d playback or 4K UHD upscaling then you could consider the Sony BDP-S3700 for only $78. The top Panasonic Blu-ray player on our list is the Panasonic DMP-BDT460 which sells for about $178. The 4K upscaling is excellent and this is one of the only Blu-ray players we could find with a SD card slot which might be handy for some of you. Additional inputs and outputs include 2 HDMI ports, 1 USB slot, and optical digital audio. There are numerous apps, but some are missing that other brands smart models include. It also has a poor remote and basic user interface. Overall the Panasonic DMP-BDT460 is a good value high-end model that we especially recommend for those of you who absolutely need a SD memory card slot. Sony’s BDP-S7200 will set you back around $178. With a release date in 2014, the BDP-S7200 is a bit older, but still a premium Blu-ray disc player. The picture quality is really good for regular HD and upscaled 4K content. Other features include 3D capability, lots of streaming services, 2 USB ports, and 1 HDMI port. One negative is that many users have complained about the unit locking up with the only cure being to unplug it, then plug it back in. While the Sony BDP-S7200 is a solid unit overall, we feel there are newer models that are just as good available at a cheaper price. The Samsung BD-J5900 was picked as a Best Buy by the leading consumer magazine and ranks high on many other best of lists due to its performance and relatively cheap price of just $75. The video quality is outstanding, however the BD-J5900 does not upscale to 4K ultra HD. It also has plenty of streaming services, but no web browser. Inputs/outputs include 1 HDMI, 1 USB port, and a coaxial digital audio output. We recommend the Samsung BD-J5900 for those of you who need a Blu-ray disc player with streaming apps, but don’t need 4K upscaling. Another option without 4K upscaling is the $98 LG BP550. It has pretty much the same feature set as the Samsung BD-J5900, but it costs over $20 more. One unique feature is the Private Sound Mode which lets you send audio (only from a disc) to your compatible smart phone over Wi-Fi and then you can listen through head phones. Overall the LG BP550 is a decent player, but there are better and cheaper options. Out pick for the best cheap Blu-ray player is the Samsung BD-J5100 which costs just $58. It is also the best-selling blu-ray player on Amazon. The reason it is cheap is due to a lack of features. It does not upscale to 4K, nor is it 3D compatible. The biggest thing missing is Wi-Fi, but you can connect to the internet via an Ethernet cable to have access to streaming services like Hulu, Amazon, YouTube, and Netflix. 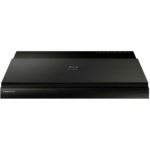 We recommend the Samsung BD-J5100 for those of you who just need a cheap, basic Blu-ray player that will only be used to play Blu-ray discs.